The ARC Group is an independent firm providing advisory services and technical project support to the upstream domestic and international energy industry. We specialize in integrated geoscientific and engineering analyses of exploratory and producing properties and projects. Our staff uses cutting edge software and hardware programs to define exploration and development targets, including the most recent geoscientific and engineering programs. This combined with many years of personnel industry oil and gas experience results in a powerful combination of disciplines to the benefit of many international, major and independent clients. We provide full-service contracting and consulting, from seismic interpretation and visualization to engineering simulation, by offering a wide range of integrated, multidisciplinary hydrocarbon discovery and recovery optimization services for both the domestic and international energy industry. Based on “The Clients” request, many of our programs are designed to meet their current needs and future ambitions. The ARC Group is Austin, Texas-based but maintains professional associations with sister consulting firms in Houston and Dallas. 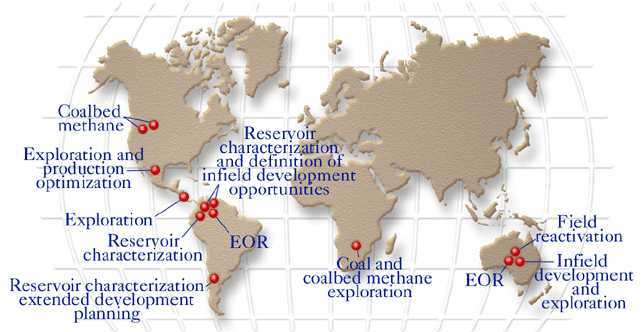 The ARC Group's successful experience in international basin play analysis and advanced reservoir characterization projects has been developed over more than two decades of successful E&P in the United States, Argentina, Australia, Colombia, Mexico, Trinidad, and Venezuela. Our experienced, multidisciplinary core of staff members is fully time-dedicated to each project. In-house expertise includes sequence stratigraphy; basin analysis; reservoir architectural and attribute analysis; reservoir geophysics including high-resolution 2-D and 3-D seismic interpretation (supported by in-house 3-D visualization software); petrophysics; engineering well completion and stimulation; production engineering and reservoir simulation. Projects are undertaken using a synergistic approach and appropriately experienced staffers are assembled to address project-specific problems.